After years of political debate, legal complications and a nesting raven, the urgent works required to ensure the crane's safety are now underway. Anxiety amongst its supporters has now moved on to concerns over the type of renovation likely to be contained in the forthcoming planning application. The immediate work now being undertaken involves welding around the splices that fix the vertical leg sections together, plus repairs to some angle braces and the stairway. It is thought the scaffolding will be up throughout the summer months. The repairs will be shot blasted and painted, so the effected sections will remain easily identified. The question of full renovation has been a saga almost as long running as the Urgent Works Notice. The ideal for the crane's supporters has always been that it is renovated to full working order, incorporating the original electronics and Grade II* listed switchgear. Historic England (ex English Heritage) may also support this ideal. At present, however, the developer seems to be planning a static crane, retaining it purely as a renovated monument. They are doubtless inhibited by the cost of bringing it to an operating level, although that aspect could probably be lottery funded. Nobody is proposing that it would operate as a commercial working crane but there are a number of advantages in it being functional. Proper maintenance could be carried out, thus avoiding deterioration of the working parts. It would then provide a practical example of early 20th century design for engineering studies. The main advantage of a functioning crane lies in the tourist appeal of having a living example of historic engineering. Britain has many tourist attractions centred on historic working machinery (textile machinery, beam engines, mills etc) and something the size of a giant crane would probably be a world's first. Apart from enabling technical demonstrations, there are more leisure orientated advantages. It has even been suggested the jib could be adapted to serve as a directionally adjustable stage for pop concert performances. The developer originally anticipated entering the planning application in April but it has been delayed, so it may still be possible to convince them to change their approach. The delay may be due to the considerable problems associated with remedial work and flood protection arising from a highly complex development. Two decades after excavations of a substantial cemetery and some settlement, fresh discoveries last month have resurrected an interest in this important Steephill site. The excavations were unable to cover the full length of the planned trench because of the presence of badgers, so a limited area was selected in consultation with the council's archaeology service. A major reason for carrying out preliminary archaeology was to check the possibility of human skeletal remains, as a continuation of the cemetery. In fact no human remains were discovered but the finds were, if anything, more revealing. The excavations uncovered a ditch and two gulleys which contained around 20 pottery sherds, animal bone and rich deposits of burnt plant material. Some of the sherds were comparable with known Dorset pottery, while others were thought likely to be locally made. They were dated as 11-13th century. The charred plant material was well preserved and subjected to microscopic examination. Among this material were cereal remains of free-threshing wheat and barley grain fragments, which is compatible with the commonplace cereal recovered from medieval charred assemblages found in Southern England. The animal bones also suggested food sources. This evidence of domestic activity is of comparable date to the limited settlement evidence found outside the cemetery in the earlier excavations. It establishes another point that limits the extent of the cemetery and widens the area of settlement. It has been suggested that much of the settlement was lost to coastal erosion but this latest discovery points to it continuing inland. The finds place increased importance on archaeological oversight when work begins on the cable trench and substation. The late owner of Stenbury Manor bequeathed the property and contents to English Heritage. Most of the contents will be auctioned off but one important item has been retained by English Heritage, while Carisbrooke Castle Museum were offered their pick of a varied collection of local artefacts. It seems the late owner, Audrey Russell, was a keen collector. She had a particular interest in the work of local craftsmen. The item retained by English Heritage is a Victorian four-horse stagecoach. 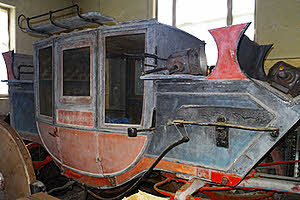 It was originally owned by 'Vanners' of Ryde and is thought to have been made by R. Bird Cheverton at Newport. Cheverton was also a coach maker to Queen Victoria at Osborne House. The coach comes with all its fittings, although in need of some renovation. It may have initially served Vanners' regular omnibus service between Ryde and Newport but at the end of its life it was operating as a tours coach, meeting visitors at Ryde for a tour of local attractions. Included with the coach are placards, leaflets and documentation associated with the tours operation. Carisbrooke Castle Museum have taken a number of locally produced items. Of particular interest is a set of six stylish chairs made by J. H. King of Blackwater. Island made antique furniture is uncommon; indeed, there doesn't appear to have been a single Island cabinet maker until Victorian times. Mr King was noted for his work on local church furnishings and operated from 1883 until 1923. The date of the chairs is unknown. 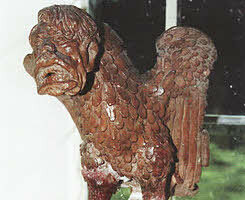 The most bizarre item selected by the museum is a terracotta model of an eagle wearing Adolph Hitler's head. The model has the eagle clutching a human victim, on a base carrying the word POLAND. It is the work of Island brickmaker Harry Pritchett. Harry had a wide range of interests and developed his own line in models throughout the 1940s, often involving unusual subject matter. Other examples of his work have previously been gifted to the museum.